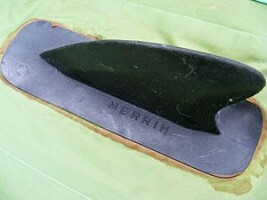 1977 Merrin, Air mat twin fin 5 ft 4"
Rubberised canvas mat, tapped seam, glued molded rubber fins, eyelets with rope and 4'' plastic handles, l/h plastic plug. 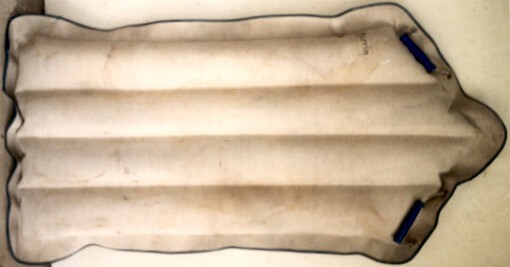 Approximately $21.50, recommended retail circa 1976. 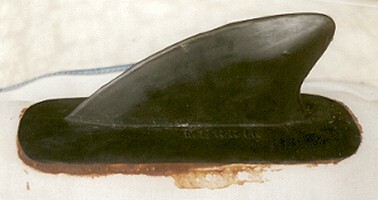 The first finned models were introduced in 1976, followed by the pointed nose may indicate later model at the end of 1977. George Greenough suggested these models went better with the tail forward (obviously without fins). My Paipo Boards and ...More. - page by Rod Rodgers, Baltimore Maryland. - Nat's Nat page 115, photograph uncredited, probably John Witzig. 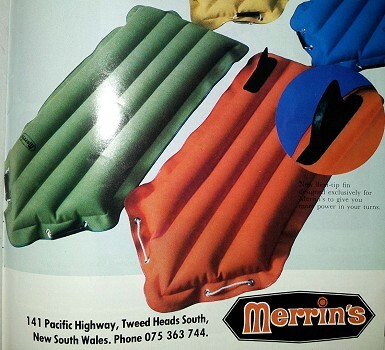 Merrin's New Finned Surf Mat, 1976. 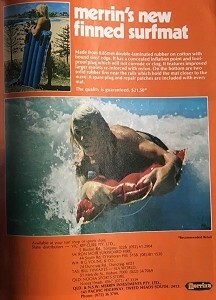 Geoff Cater (1999-2019) : Catalogue : Merrin Surf-Mat, 1977.